The hurry-up-and-build-it crowd received a taste of the uber-patient approach managers of the GTA’s super projects need to take at this week’s Land & Development Conference in Toronto. 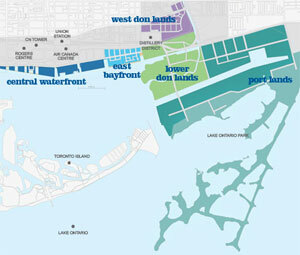 Four development managers laid out their plans for development including the architect of the biggest of them all, namely Waterfront Toronto president and chief executive John Campbell. The Waterfront Toronto supremo crammed in a ton of information in his five-minute presentation. * It’s huge. The 2,000 acres under development represent the largest urban redevelopment project in North America. It dwarfs New York’s 97-acre Battery Park City redevelopment and London’s Canary Wharf (297 acres). * It’s expensive. When all is said and done, it represents about $35 billion in total investment, of which $6 billion to $8 billion will comprise public infrastructure. * It will take a long, long time. Campbell estimated 40 years before adding “I’m not sure how long it will take actually.” A lot of people will end up living and working there. It is currently estimated to be home to 40,000 units or 115,000 people, and 10 million square foot of office space. * It’s challenging. All the land south of Front Street is fill. “You are talking land that is 50 to 100 years old, no bearing capacity, Lord knows what they put there, it is all brownfield plus the water table is around six feet,” Campbell said. * It’s overdue. “The first study was done in 1793 on the waterfront; not a lot has happened since,” he joked. Campbell’s mandate is not just to fill up the empty space that runs along the waterfront south and east of Toronto’s downtown core but in many ways, how do you fix what ails the GTA? “It is about revitalization, not redevelopment,” he said. “How do you stop urban sprawl, promote transit, promote sustainability, provide housing for all Canadians and not just become an enclave of the uber-rich (hello New York). How do you really make it a high-quality place, build a great public realm, because great cities are known by their public realm. There are also some pretty enormous engineering challenges, not the least of which is to protect the 850-acres Portlands, which sit south of the mouth of the Don River, from a Hurricane Hazel-sized storm surge. Currently the river makes a sharp right turn in front of those lands, a precarious position due to an increasingly unstable climate. The solution is to build two other channels for the water, which comprise $800-million to $900-worth of engineering projects. As any GO Transit, Toronto subway strap holder or anyone driving through the city’s financial district can attest, Union Station is a mess. Construction crews and hoarding are everywhere and Front Street remains closed to vehicles. Brad Keast, vice-president of development with Union Station redevelopment manager Osmington Inc., cut to the chase. Answer: before the Pan Am Games which take place July 15. Keast addressed the question of why some super projects get off the ground while others can’t reach the launch pad. In Union Station’s case, there was a clear need, a financial means, public buy-in, a transparent process and a hard deadline. 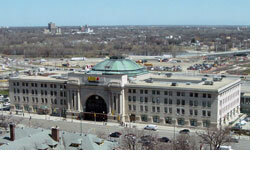 Redeveloping Union Station, which was opened in 1927, was originally proposed in the early 1970s, a time of a fair amount of public opposition to big projects (the Spadina Expressway was killed as well as a proposal to demolish Old City Hall). The latest efforts at redeveloping the second most-important heritage building after Ottawa’s Parliament buildings were convoluted and eventually led to Osmington being selected to lead the project at the end of 2009. The $640-million Union Station revitalization, which is slated for final completion in 2016, includes the restoration and preservation of many of Union Station’s heritage elements, creation of a new pedestrian retail concourse below the station, expansion of the GO concourses by threefold to accommodate the expected doubling of passengers at Union Station by 2030, restoration of the VIA Rail concourse, creation of a new PATH system connecting the northwest corner of Union Station to Wellington Street, expansion and an increase in the number of station entrances, including the addition of a new PATH connection and tunnel to Union Plaza, Air Canada Centre and Maple Leaf Square. “The biggest question that gets asked after Front St. is, ‘You have been under construction for four years, why has nothing happened?’ ” said Keast. “There are actually a number of projects happening at once. In addition to what is called the Dig Down, which we are involved in which the city is leading, there is also the new train shed with a glass atrium over the tracks, the TTC is doing a second platform, there is a new connection going up York St. Once those are down, Front St. will be redone and also the terminal for the Pearson-Union express” rail line. The panel also featured presentations by Barry Lyons, who is involved with Mississauga’s Lakeview redevelopment on the largely OPG-owned lands, the former site of a lakeside generating stations. Catherine Rose, chief planning of the city development department of the City of Pickering also spoke about her city’s Seaton development on a former provincial landholding of about 3,000 hectares.